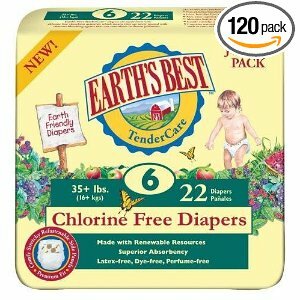 Earth’s Best TenderCare Chlorine Free Diapers from $0.19 Each Shipped. Reduce your baby’s environmental footprint and protect their sensitive skin with Earth’s Best TenderCare Chlorine-Free Diapers. These disposable diapers feature chlorine-free, cloth-like materials that are made up of naturally absorbent corn and wheat byproducts. Earth’s Best TenderCare diapers provide your baby with a comfortable fit that helps minimize chafing and rashes. The .19/diaper is for size 1. I need size 5 which is .32/diaper with the S&S discount. I really wanted to buy a better diaper, but this is too expensive. I will stick with Huggies Value pack at .22/diaper.